DEBORAH CROMBIE: It's quiz day on Jungle Red! A: Stuffing yourself with really rich food until you think you'll pop. E: Shopping. It is, after all, the day before Black Friday. Well, maybe a little bit of all of those things, although in our family we don't shop on Black Friday. (I can't imagine many things I'd rather do less...) We do love the food, and the gathering of friends and family. And I even like the ritual football, though I'm not a regular fan. It is, of course, also a celebration of gratitude, but isn't it weird--or maybe uniquely American--that we set aside merely one day for thanksgiving? The Japanese have a custom of beginning meals by placing the palms together in front of the heart and saying aloud itadakimasu, roughly translated as "I humbly receive." 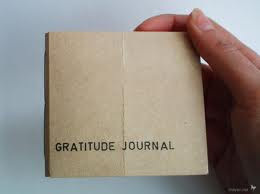 It seems that the method for measuring the effect of gratitude used most frequently by researchers is the Gratitude Journal. I was a bit surprised to hear that this was "new," as I've kept a gratitude journal off and on for about twenty years. And I've found that when I do this regularly, I feel better, mentally and physically, I'm more productive, and probably much nicer to be around. But the key word here is regularly. I backslide. I get busy and tired and stressed and stop doing something that I KNOW will make me feel better. So I wondered if any of you, fellow Reds and readers, had used gratitude journals, and if so, do you have any tips for the rest of us? HANK PHILLIPPI RYAN: Oh, I've kept journals, In my twenties. I went back and looked, hoping for insight. What I got was: men. No more needs be said. As for gratitude: The other day, an acquaintance and I were in a Burger King. (Glamorous business lunch.) A particularly unpleasant/unhappy/unkempt couple walked in. My colleague turned to me and whispered "Deliverance." At just the same time, I turned to her and whispered: "There but for fortune." HALLIE EPHRON: I'm a big blessing counter (my glass is half full! ), though I don't catalog them in a journal. I do feel inordinately fortunate to have the life I have--a career that's going on twelve years old, opportunities to travel, friends who are mystery writers (simply the best, most generous and interesting people) whom I'd otherwise never have gotten to know. Two gorgeous (grown) daughters and a (very grown) husband who still tolerate me. Not to mention the simplest of things--like today I peeled granny smith apples for pie and had the loveliest plate of apple peels with my lunch. RHYS BOWEN: I've also never been able to keep a journal. I find I simply can't put down my innermost thoughts on paper. But I think a gratitude journal is a great idea and may even start one. I've lots of things to be thankful for, starting with celebrating Thanksgiving with my family. To be surrounded by the love of family and friends is the most important thing in the world to me. And as Hank has said, I'm amazed and blessed by the number of true friends I've made in the mystery field. They make every meeting and convention a joy. I am grateful for my health and certainly don't take it for granted any longer. I am grateful for a writing career that has spanned a lifetime and the miracle that I still have two publishers who like my books and fans who will buy them. I am grateful that I have had a chance to travel and see the world, and appreciate nature and beauty and that I'm never bored, and love to laugh. JAN BROGAN: Debs, I think its funny that you are surprised by the Japanese beginning their meals by placing their palms together and saying I humbly receive. I mean, isn't that grace? I grew up saying grace BEFORE the meal, with the lines "Blessed is the Lord with these thy gifts we are about to receive." And we actually had to say grace after dinner before we got to leave the table, too. Today, at least in Massachusetts, home of the pilgrims, I'm sorry to say that many people would look at you askance if you said grace, even quietly, in a public place, UNLESS you said it in JAPANESE. Or maybe Hindu. Sometimes they allow it at Thanksgiving, though. But I digress. Yes, absolutely. Gratitude is the antidote for unhappiness or malaise. We all get so used to our incredible lives that we take them for granted and focus on what we don't have. But I think the most positive thing about getting older is that you really do learn gratitude. I kept a journal for years that was a lot like Hank's. Mostly about boys/men. I should burn the evidence. But I do meditate each morning and I end each session with a few minutes of gratitude and don't tell anyone, even prayer. DEBS: Lucy, I LOVE the brown paper tablecloths! My daughter is making a "thanksgiving tree", an arrangement of bare branches, with tags that guests can write on and attach. Two lovely ideas to celebrate the day. And Jan, I didn't forget about saying grace, but to me the Japanese custom seemed more secular. But this may be because I grew up in a family that didn't say grace, and anyone doing so would have been a huge embarrassment. A shame, that. Hallie, the apples are the kind of thing that I put in a gratitude journal, when I manage to keep one. Five things a day, even if sometimes the only thing you can manage to write is "bed" five times:-) But it teaches you to be mindful of those little things, as well as the big ones, and it is the little things that make up the chain of our days. ROSEMARY HARRIS: I never kept a journal as a child - I'd be curious to see what I would have written, probably just the little dramas of puberty like everyone else! I'm grateful every day and I'm constantly telling myself how lucky I am. Yes, I have all the basics (and then some) but I have a wonderful husband who lets me drag him up mountains, down rivers, onto houseboats and into tents and almost never complains. I've had fun jobs all my life and even though I never made a ton of money I had great experiences and met some incredible people. And now I'm getting to try my hand at writing. (After 4 books I think I'm still learning) and I'm fortunate enough to have the time and the opportunity to make this dream a reality. At the risk of sounding corny, this year I'm also grateful that I live in America, that my parents instilled in me their values, that I'm still learning new things and making new friends, that I've read so many good books this year and shared good times with the people I love. And just because I'm me and can't ever be totally serious - I'm glad I found that black dress on sale, that Lou Reed has a new album, that I have tickets to see Mandy Patinkin and Patti Lupone on my birthday, and that Demi Moore has finally dumped Ashton Kutcher. You can do BETTER! DEBS: Can I say AMEN to that? We at Jungle Red wish you all an equally rich list of blessings, and a very Happy Thanksgiving! I try to be grateful every day, and it's one of the things I most encourage in my daughters. If you've never read the poet Mary Oliver, you're missing some of the finest, most uplifting expressions of gratitude ever written. (I recently discovered her work.) You won't look at a sparrow or blade of grass the same after reading her, I promise. I agree, we should be grateful for what we have not only on Thanksgiving. We should find good reason to thank for all the nice things we have in our life. This Thanksgiving, I have one big thing I'm thankful for, and I don't really need any other blessings: my husband continues to be cancer-free. That is an excellent blessing, Julia. Laura, I'm going to have to check out Mary Oliver. And along those lines, I'd recommend Thich Nhat Hahn as an awesome inspirer of gratitude. He's also such an incredibly beautiful and efficient writer. Okay, just went to Amazon to check out Mary Oliver. Laura, I need help....which book should I start with. I'll start with this post...thank you for showing me how it's done. Have a blessed holiday! Eleven years ago last week, we flew from Wisconsin to Oregon to be with our son. He had surgery that produced a 16-pound non-malignant tumor (which he named his "turkey buddy). I'm grateful for his courage, his happiness, his generosity and his cancer-free body. I'm grateful for my husband -- one of the good guys. And I'm grateful for all of gracious Jungle Reds, who brilliantly dispense both life and literary wisdom as well as extend friendship to all of us. Thank you! Ann, and we're grateful for you and all our visitors! Good lord, a 16 pound tumor--that is truly terrifying. Julia, we are grateful for that blessing too!!!! And for my hub's health too--another one of the good, good, good guys! Among many other things, I'm grateful that the mystery community is so warm, welcoming, and fun. Thanks to all the Reds and contributors for providing interesting discussions and welcoming us all to join in! I've always been a journaler, but these days I gravitate toward journaling when I'm down and I need to process. In moments like these, I note down three things to be grateful for each day. It is helpful. I think I heard about the three/day gratefulness list from Oprah about 15 years ago :-). Every time I see your names pop up in the comments, I think--oh! How wonderful! And I'm grateful every time..
A grateful journal, eh? Never thought about keeping one. I have, however, kept a journal since the age of 8, so maybe that sort of counts. Of course it's not specifically for the purposes of writing down my blessings, but it has more or less served that purpose to a certain degree --if not at the precise moment of writing, then in hindsight. Still, when it gets to days when I just don't have the patience to write down whatever goes on in my head, writing down my blessings would be a good motivater!